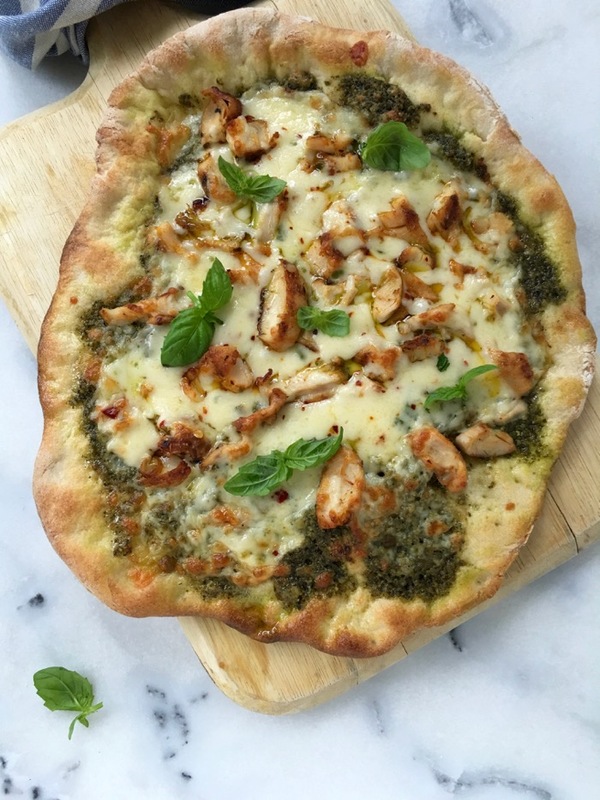 I’m back with the promised ultimate chicken pesto pizza from scratch! I am clearly on the pizza train here, but I really can’t help it. I made and froze two batches of my Italian pizza dough yesterday, and so of course it was the perfect reason for me to make one more pizza. 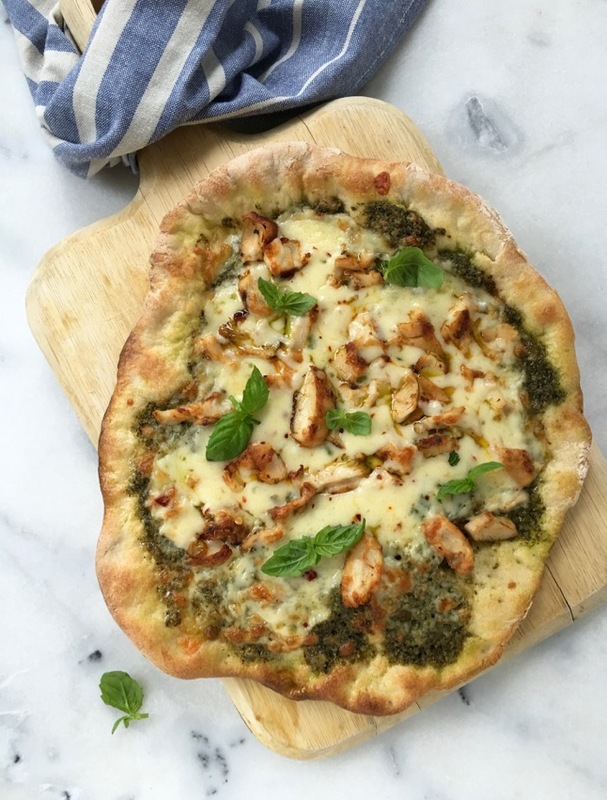 Yay for chicken pesto pizza for dinner on a rainy Tuesday! Seriously though, You’ve got to make the perfect grilled chicken from last summer to use in this recipe. Sure you could also use rotisserie chicken, or really whatever chicken leftover you have around. 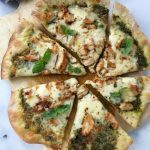 But to really make this pizza be as special as it is in my dreams, I need to make that grilled chicken tenderloin covered in the smoked paprika spice mix. Holy grilled chicken, you’ll see what I’m talking about! I switched things up a bit and made a vegan walnut pesto sauce, but you can just make a classic Genoese pesto with pine nuts, basil and cheese. Then I layered slices of my favorite organic pepper jack cheese, followed by the chicken and a sprinkling of more grated pepper jack. I want that cheese to just nicely hug the chicken from all sides like a cozy blanket. Don’t mean to sound like a broken record, but I sure do hope you grabbed a pizza stone from amazon already. You really need to have a hot pizza stone to cook a crispy pizza crust at home. Not only that, but make sure to preheat that pizza stone together with your oven as high as it is allowed for a good 45 minutes or more. Mine only goes up to 500°F but really perfect temperature for thin and crispy crust. 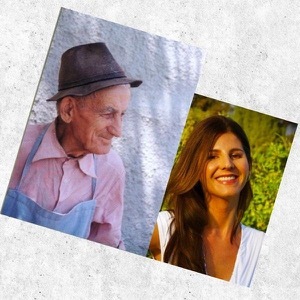 Hey, did you know that pizza was invented in Napoli Italy? Just like it is the case with every single pizza that I make, I always bake the crust for a couple of minutes on my pizza stone before adding my topping. Then I take it out of the oven, so the oven won’t get cold while I assemble all my toppings. Back into the oven it goes for about five minutes or so, just until the cheese is nicely, gooey melted and the crust has little crispy brown marks. This little step is what makes the difference between crispy pizza bottom or a soggy center. Simple as that. 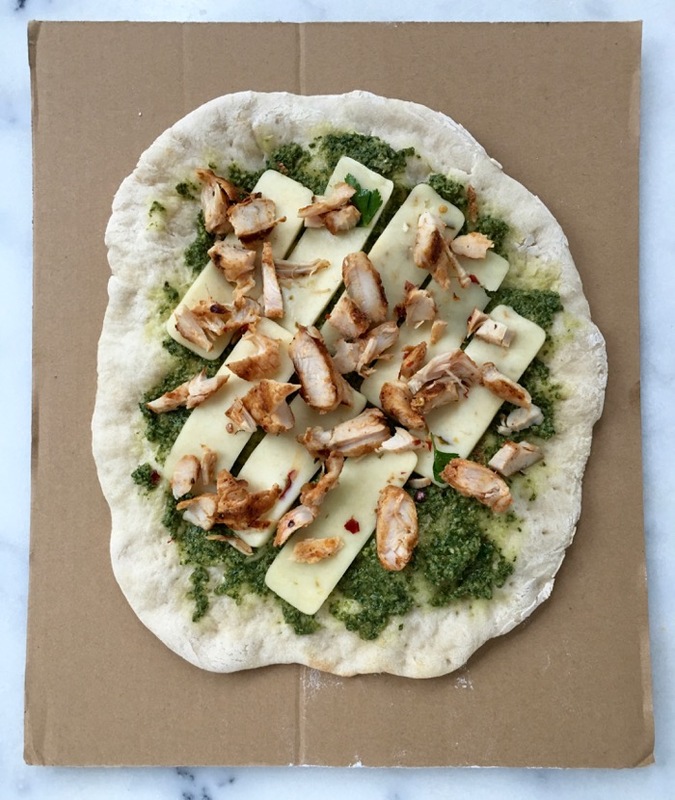 Once summer rolls around you can actually grill the pizza dough right next to the chicken on your grill, then add all your goodies on top and let the cheese melt. I might be in trouble with the Napolitana pizza police for this one, but the dough is on point tough! That should count for something right ?! P.S. 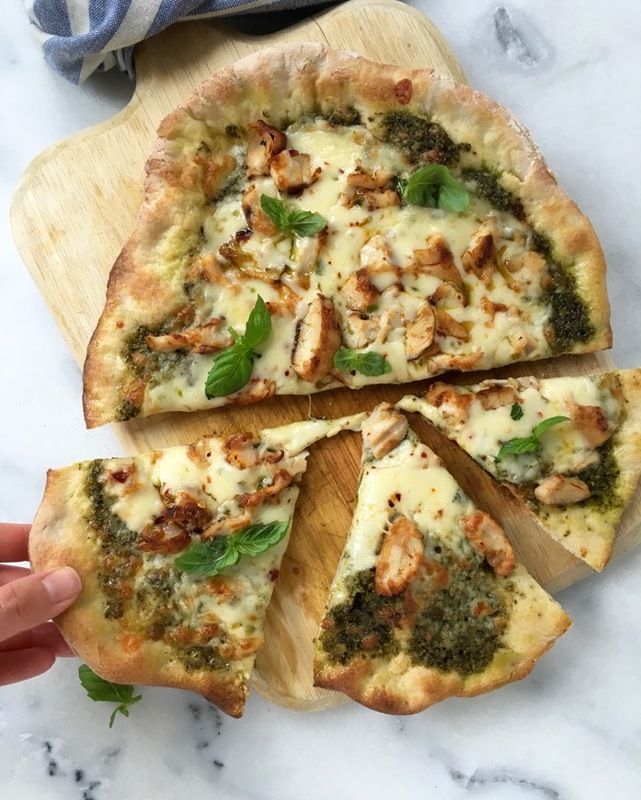 Hey, did you know that the best way to slice this pesto chicken pizza is not with a pizza cutter, but with your kitchen shears..? 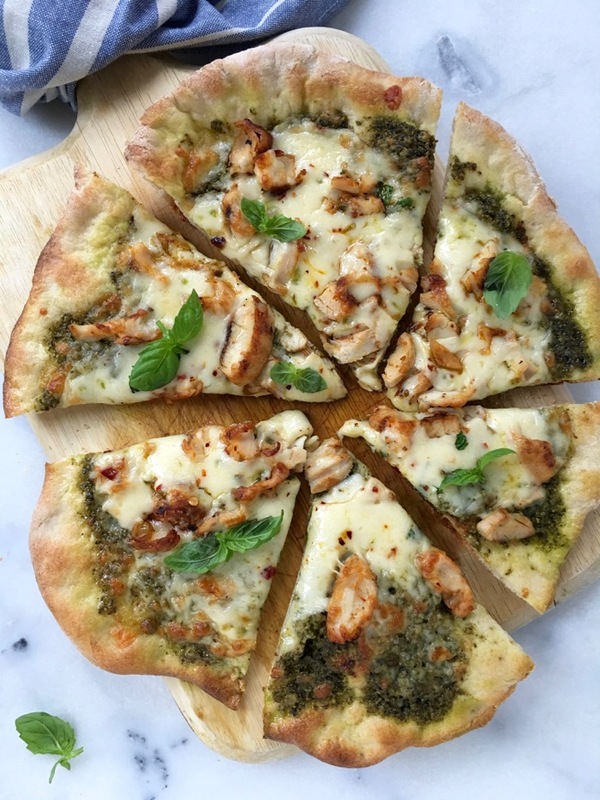 The ultimate cheesy gooey chicken pesto pizza with the crispiest crust and a kick from pepper jack cheese. Prepare your pizza dough according to the recipe directions. Add the basil leaves, walnuts, garlic, olive oil and lemon juice to the bowl of a food processor and puree until smooth but still with a little bit of texture. Adjust seasonings to your taste with sea salt and refrigerate until ready to use. Preheat your oven to 500”F with the pizza stone in it for at least 45 minutes or longer. Sprinkle some flour on your kitchen counter or over a pastry board and place one of the pizza dough balls on top. Sprinkle with some flour and using the palm of your hand gently press down on the dough until flat. Flip the dough on the other side and sprinkle some more flour on top if needed. Continue to press down with the palm of your hand and gently stretching the sides until the pie is thin too your liking. You could also use your knuckles and help stretch the dough as well, just be careful not to tear it. Sprinkle some flour on your pizza peel or cardboard and gently place the dough on top. Sprinkle a little flour or corn meal on top of the pizza stone in the oven and very carefully transfer the pizza pie to the pizza stone. Just give the pizza peel or cardboard box an nice little shake and it will slide right in. Bake the pizza pie for 3 minutes then remove it from the oven back to your pizza peel. Spoon a thin layer of the walnut pesto over the top and layer with the pepper jack cheese slices. Sprinkle the grilled chicken on top and a little bit more pepper jack cheese. Gently transfer the pizza pie back to the hot pizza stone and bake an additional 5 minutes or so , until the cheese has melted and the crust is crispy. Repeat with the remaining pizza pies and allow each pizza to rest for a few minutes for the cheese to set before cutting into it. Sprinkle with the fresh basil and enjoy with extra red pepper flakes on top. Thanks for the tips on using the pizza stone. Fresh uncooked garlic is very hard on my stomach so I have changed most of my garlic recipes into toasted garlic recipes (sorry, don’t faint) and I am making pesto right now and have experimented with blanched garlic (did not love) and slightly toasted in olive oil to take the pungent taste off, but i wonder if you’d use baked garlic? Which would you use and why?? Thanks for any tips you might have! Hi Michele ! yes i know that feeling garlic can cause and I’m dealing with it because of my husband’s sensitivity as well. I love roasting heads of garlic drizzled with a little olive oil in their own paper.Then jus squeeze it out onto bruschetta or in pestos. It has a very sweet creamy taste and not heavy on the stomach at all. Hope you try it that way, it is such a delicacy.